Cast: Ziyi Zhang, Ken Watanabe, Michelle Yeoh, Suzuka Ohgo. Directed by Rob Marshall, adapted from the book by Arthur Golden. Story: A child is taken away from her family and grows up to become a geisha in early 20th century Japan. 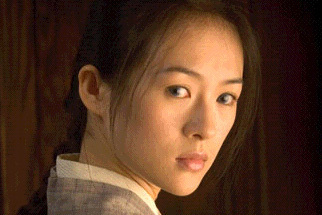 Memoirs of a Geisha is a movie steeped in oriental atmosphere, full of eastern promise. Dig through the polished presentation and underneath you find a rich vein of ... well, nothing actually. It's as shallow as a pub measure and somewhat less fulfilling. The first, and by far the most obvious problem is the delivery of the dialogue. Do you remember 'Allo 'Allo? Where you could tell what nationality the characters were pretending to be by the accent they spoke English with? I can't help but be reminded of René Artois - all the characters stumble slowly and painfully through their English dialogue, but if they spoke any faster they'd be unintelligible because their accents are so strong. What's even more peculiar is that they speak exactly the same to the Americans when they show up later on. Cinematic licence, I suppose, but I couldn't help expecting one of zem to leesen very carefoolee - zey will say zees only wurnce. The second problem is the supporting actors. The leads are well-known - bright blue-eyed Ziyi Zhang (Crouching Tiger, Hero), Ken Watanabe (Batman Begins, Last Samurai) and Michelle Yeoh (Tomorrow Never Dies) are all noticeably professional, but Li Gong (an established Chinese star) must have put on a stone with the amount of scenery she chews - not what we expect in a mainstream movie nowadays. Little Suzuka Ohgo is pretty good as the child star, though her delivery needs work, but the supporting acting in toto is highly amateurish. More than once I thought I was listening to Yoda instead of a serious performance. "Successful geisha, you will be." Still not done with the flaws I'm afraid. The story, whilst solid enough during the first half, is not strong enough to support the long running time and has a very strong feel of having been cut from an even greater length. Once we hit the two hour mark, the tone changes like a light bulb, the main geisha heroine's character collapses completely and the story finishes pathetically and incongruously. I cannot believe this is the original ending. It's shallow, unsatisfying and disappointingly curt. Half an hour could have been cut from the body of the movie and replaced with a properly constructed conclusion. OK, that's enough slagging off. The eastern atmosphere is developed extremely well, helped immeasurably by John Williams' dramatic and unintrusive score and the cinematography is very nice indeed, with the Japanese feel being effective and complete, despite most of the lead actors being Chinese - a fact that I didn't even notice until I was researching this review afterwards. The atmosphere extends to the geisha's ethos - so much so that it seems perfectly honourable when our heroine sells her virginity to the highest bidder. This detail becomes muddled later on - being an ignorant westerner I had the impression that a geisha was essentially a classy prostitute. The first half of the movie seems to confirm this preconception, but the latter half denies it, so I'm still none the wiser. Damn stupid Brits. Memoirs of a Geisha is not at all what it purports to be and falls well short of its potential. Stylish and beautiful it is, clever and meaningful it most certainly isn't. The aesthetics make it worth a watch if this is likely to be enough for you, but don't expect anything more. Testosterone Satisfaction Rating: 1/5 Ziyi Zhang teases but never shows. To enjoy this film you should be: absorbed by the atmosphere. Memoirs of a Geisha is released in the UK on 13th January.